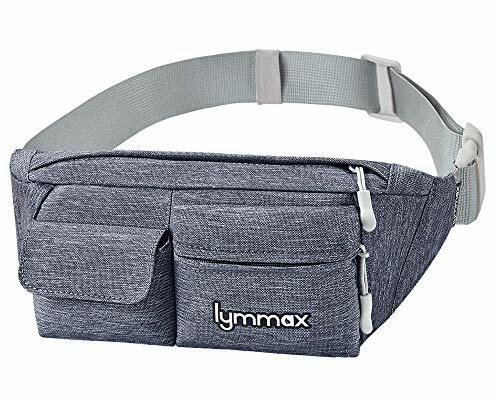 Lymmax Fanny Pack Slim Waist Bag Pack Waterproof Bum Bag Running Belt for Men Women Traveling Cycling Hiking Camping Running Dog Walking, Large Capacity by Lymmax at Luxury Bags Sale Store. MPN: L170017_Darkgrey. Hurry! Limited time offer. Offer valid only while supplies last. 【ENOUGH STORAGE ROOM】 The travel fanny pack for women men has four pockets,it is enough carrying phone, purse, keys, cashes, credit card,passports while out dog walking or on holiday ,running,very convenient. 【ADJUSTABLE WAIST BELT】 Fully adjustable waist belt fit for waist size (22"-43"), and it can be used as single shoulder bag, bum bag,dog walking bag,waist bag,running belt. 【WIDE USAGE】Waist pack Great for Hiking, Walking, Travel, Running, Cycling, Fishing,all kinds of outdoor sports and daily use, keep your hand free and enjoy your life. 【1 YEAR WARRANTY】 Our friendly and reliable customer service will respond to you within 24 hours! You can purchase our women and men fanny pack with confidence, with our 12 month warranty, or 30 days money back guarantee and of course our lifetime support guarantee. If you have any questions about this product by Lymmax, contact us by completing and submitting the form below. If you are looking for a specif part number, please include it with your message.